BY ORDER OF THE TRINITY I OFFER YOU THE DIVINE WORD AS FRESH WATER FOR THE SOUL. You are heading towards the commemoration of Holy Week and it is precisely on this journey where Our King and Lord Jesus Christ offers you liberation from the chains of evil, from the misused human ego, from the self that has allowed depersonalization and has been mixed with new unnatural definitions with which your personality is being taken over. THE ART OF EVIL INVADES WITHOUT THE HUMAN CREATURE PERCEIVING IT, FOR THE PURPOSE OF ALIGNING A GREAT MAJORITY WITHIN A SINGLE PSYCHOLOGICAL SCHEMA, ACCORDING TO ITS NEFARIOUS PLANS: keeping man in lower states in order that he offends Our King and Lord. Beloved People of Our King Jesus Christ, man – depersonalized and overrun by evil – has accepted thinking rejected by Creation and behavior unknown to Creation. Man believes he has the right to act freely and demonstrates it by rebelling against everything that can be an obstacle for him; those who act responsibly do not fear being left alone because of not being understood for not being within forms of modernism and licentiousness. THE CROSS IS NOT TO BE UNDERSTOOD, IT IS TO BE LOVED, in It is found the whole life of each one of you, with your defects and virtues, successes and failures, so that you never think of yourselves exempt from successes or failures. The Way of Calvary is the life of every human creature who loves God, hence the falls, spitting, whipping, shoving, rude words, shouts, misunderstandings, falls and Simons of Cyrene, as in life everyone needs a Simon of Cyrene. WHOEVER CLAIMS TO UNDERSTAND THE CROSS WILL REMAIN LAGGING BEHIND, NOT FEELING UNDERSTOOD BY GOD AND THEIR BROTHERS, SEEING THEIR HUMANITY AND THEIR IMPOTENCE, FORGETTING THAT THOSE WHOM GOD LOVES HE MOULDS IN DIFFERENT WAYS AND BY VARIOUS MEANS AT WHICH MAN IS SURPRISED AND WHICH HE DOES NOT UNDERSTAND. DO NOT FORGET THAT EVERYONE WILL BE TESTED, at the most critical point of their humanity: one by one all will be tested, one by one you will know mercy or impiety, charity or rejection, that abounds at all levels of society. This period of Mercy is grace and blessing that the Most Holy Trinity offers you, it is an instant prior to when you will see yourselves as you are, therefore Mercy does not come only from God, but from among men of good will, where man must exercise his virtues. On the cross man becomes smaller so that Our King Jesus Christ might shine more brightly, and in this way what is primal in humanity will no longer be of man, but will remain subject to Divine Love. 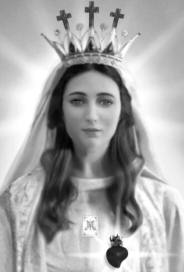 Our and your Queen is the Flame that enlightens the People of Our King and Lord Jesus Christ, leading you along the paths necessary for the human soul in order to keep it strong, convinced and converted before the true tests of great divisions and great persecutions wreak havoc on God’s people. The hosts of evil are wandering the world in complete freedom, freedom granted to them by man’s detachment from the Divine. The souls that continue like the fig tree without bearing fruit (cf. Lc 13:6-9) and do not make amends are like the fig tree and will not bear fruits of Eternal Life. Man’s debauchery has led him to fall into the fetid abyss where sin is reproduced uncontrollably; evil wastes no time in fulfilling its objective. The People of God must take advantage of every instant to grow without leaving space for evil to enter their ranks. In the past, leaders of humanity made pacts with Satan, committing the nations that they were governing in the service of the Antichrist and his tentacles, and this succession of pacts has continued to be upheld by economically powerful families. People of God, Freemasonry prevails within the church of Our King and Lord Jesus Christ, maintaining pacts and alliances that undermine the structure of the Church, leading to schism; THAT WILL BE WHERE THE FAITH OF THE PEOPLE OF GOD WILL KEEP YOU FIRM, STRONG, SINCE THIS PEOPLE OF GOD WILL BE PERSECUTED, NOT UNDERSTOOD, SINGLED OUT; THEN FRATERNITY WILL MAKE THE NECESSARY LOVE GERMINATE SO THAT OUR QUEEN AND MOTHER, MOTHER OF HUMANITY, AND WE THE CELESTIAL HOST, MAY GUARD YOU AND SUSTAIN YOU SO THAT THE SMALLEST NUMBER OF CHILDREN OF OUR KING AND LORD JESUS ​​CHRIST WOULD DESERT. People of God, faith is tried, the ravages of nature increase and come unexpectedly; the Sun puts Earth on alert. The threat of a celestial body coming from the Universe is alarming, and humanity will suffer. Prepare yourself tenaciously and without distractions; the earth shakes. The water of the seas does not calm down, but on the contrary, it enters the land. Man must instruct himself correctly, not incorrectly, because without God, he is nothing. I bless you – as My children, I call you to remain constantly active so that your brothers and sisters prepare properly for what humanity must experience. Do not be distracted: stay directed towards the goal to which you are called by My Son. Grow now, as afterwards it will be difficult for you. Beloved children, remain united so that, in the unity of My Son, you might support one another. Those who know that this is a time of waiting for Divine Mercy must alert the People of God in season and out of season so that fewer children get lost. TRINITARIAN MERCY WILL POUR OUT ITS FOUNTAIN OF FORGIVENESS FOR THOSE WHO WISH TO MAKE AMENDS, TO PREPARE AND ACCEPT THIS DIVINE GRACE WITH FIRM PURPOSE OF AMENDMENT, THUS HUMAN BEINGS MUST MEDITATE ON WHAT IS WORLDLY AND FINITE OR ON THE ETERNAL GREATNESS OF SAVING THE SOUL. Man accepts modern trends very quickly at an instant when he has been turned into a mass for this purpose, as an anticipation of the great revolts that you are experiencing and which will intensify over the Earth. Armed struggles in various countries, the shortage of food and famines caused by plagues in various countries, the lack of awareness concerning poor and abandoned countries and the usurpation of countries by men who are foreigners in other lands, will result in continual threats of war. Do not forget, beloved of God, that war has not stopped; believe it still less when peace treaties are made, as these are not true. Pray without hesitation, do not recite, but pray with your heart, powers and senses, until prayer becomes one with you. Prayers are not lost, neither are they held back on the way, but on the contrary, prayers are not unheard, and given the infinite Love of Our King, prayers can attenuate, not everything, but in some measure, yes, the attacks with which humanity will be dealing throughout the planet. Children, you have knowledge of the tireless work of Satan, and yet you remain with your lamps almost empty of faith, and you sleep with great ease, while the enemy of the soul causes destruction among the People of God. My Calls cause you to fear and yet sin does not make you afraid, even knowing that eternal death awaits the unrepentant sinner. It is not a fable, it is the lake of fire where the absence of the presence of God is the most terrible torment. Great Tribulation awaits the Earth, great suffering for man: water, fire, air and earth cracking and shaking due to earthquakes. Japan will suffer to the core: pray for Japan. Pray for Puerto Rico: it shakes with its Heart. Pray for Costa Rica: its land is shaken. How does Christianity commemorate each event of the Life, Death and Resurrection of Our Lord Jesus Christ, King of the Church? With pronounced liberalism, without decorum or respect, for in every place there has ceased to be heard human beings praying. Prayers have been exchanged for strident, senseless music, offensive to God and to man himself, without thinking that character, emotions and human sensations are transmitted in the human body depending on what it has inside. In this instant before man faces the events, he needs to grow in the spirit, ordering himself in the spirit, in order to overcome the crucial instants that he will face. Some children of the Most High are preparing great refuges in which to stay in bloody instants for humanity, and this is not bad, only that before saving the body you need to save the soul, at the same time being united as brothers and sisters, keeping yourselves properly prepared; whatever you undertake will flow for good. I call you to pray for France, which suffers invasion. I call you to pray for Mexico and the United States, their soil will be shaken. 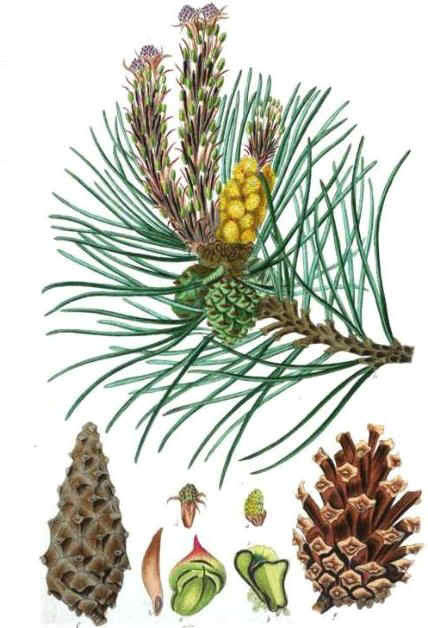 A STRANGE ILLNESS IS COMING TO HUMANITY, HIGH FEVERS AND WOUNDED SKIN WILL BE A SCOURGE FROM ONE INSTANT TO ANOTHER, FOR WHICH YOU SHOULD USE THE PLANT CALLED CALENDULA (1). WALK SHELTERED IN THE LAW OF GOD, do not flirt with what is unnatural, sinful and causes spiritual leprosy, which proliferates abundantly in those who offend our King and Lord Jesus Christ, making the evil spirits that roam the air in search of souls adhere to them. Great diabolical infestation in human beings is growing, finding fertile ground in those who live without the Law of God. Beloved of God, evil gives malignant meaning to what man uses; evil acts immediately and the people of God accept everything very foolishly this indicates the spiritual ignorance of those who say they follow Christ. Remain attentive and be faithful in fulfilling the Law of God and fulfilling the Truth of Sacred Scripture. UNITE AS THE PEOPLE OF GOD – BE A SUPPORT FOR ONE ANOTHER: PRAY FOR ONE ANOTHER, OFFER EUCHARISTS FOR YOUR BROTHERS AND SISTERS AND FOR YOURSELVES SO THAT FAITH DOES NOT DECLINE BUT BE STRENGTHENED BY THE PROTECTION OF OUR QUEEN AND MOTHER. 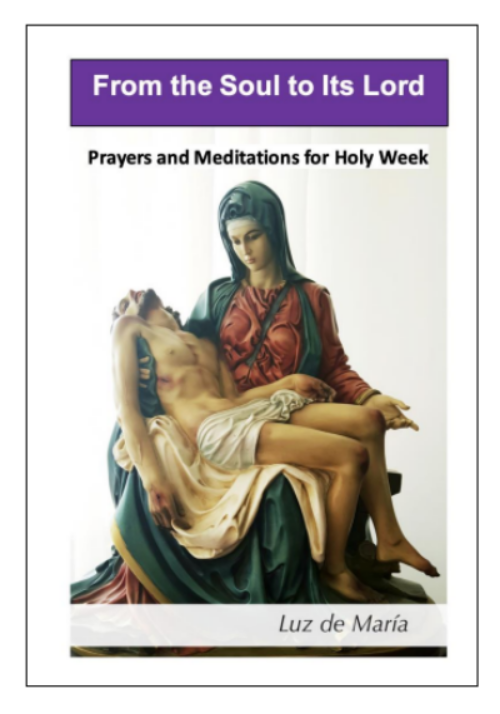 As we begin this Holy Week, we offer readers this book or prayers so that as God’s People we unite ourselves with Our Lord Jesus Christ and with Our Blessed Mother, and as Church we live out these Holy days with the intent of offering, making reparation, and transforming into new creatures. MY MOTHER INTERCEDES FOR EACH ONE OF YOU, WHETHER YOU LOVE HER OR NOT. My Mother does not want Her children to be lost. My Mother remains attentive to the desert of the heart of the man who does not respond positively to Our calls, does not respond to inner change, to the need for him to commit himself eagerly and decisively now! THIS IS THE INSTANT OF TRIALS FOR THIS GENERATION THAT HAS ABANDONED LOVE AND DISTORTED THE TRUE MEANING OF THIS INFINITE GIFT. YOU ARE RESISTING LOVING ME IN ORDER NOT TO LEAVE BEHIND WHAT IS WORLDLY, therefore your decisions are not right, as they go hand-in-hand with the fear of being singled out and rejected for being Mine; because of this you are disturbed in your spirit and emotions, having a great weakness in being able to fight these disturbances. HUMANITY HAS REGRESSED IN DISMISSING MY POWER; you have stagnated in denying the authenticity of My Truth, encouraging the devil who puts flags into your hands so that you are increasingly divided and so that there is confusion in everyone and everything. Within My Church reigns confusion, division; some decide to receive me in one way, others in another – some in a state of Grace and others empowering sinners so that whoever is living in sin receives Me. I AM CRUCIFIED AGAIN AND AGAIN. YOU DO NOT PRAY WITH THE HEART, BUT IN THE DISTRACTION OF YOUR THOUGHTS; YOU DO NOT SPEAK TO ME WITH CONFIDENCE – PRAYER AND FRATERNITY ARE LACKING. My children are a reflection of My Light and must take My Light wherever they go, taking it to those who walk in lukewarmness, to those who do not persevere in changing and who, of their own accord, are turning away from My Mercy at this instant. BEFORE MY CHILDREN ARE EXAMINED PERSONALLY, YOU FIND YOURSELVES WITH THE BLESSING OF CHANGE IN FRONT OF YOU, thanks to the prayers and intercession of My Mother in order that the Warning does not find you unprepared. She is the Woman clothed with the Sun, with the Moon under Her feet (Rev. 12:1b), who in the silence of this instant has pleaded for this mercy for Her children, after which She will let the Hand of My Father fall on humanity. Thus, what is written and prophesied will be fulfilled, so that My faithful ones would not be lost. CHILDREN, THE DEVIL IS USING ALL HIS TRICKS SO THAT YOU DO NOT CHANGE YOUR LIVES, SO THAT YOU CONTINUE IN SINFULNESS, SO THAT YOU ARE SELFISH, SO THAT YOU ARE NOT MERCIFUL, SO THAT YOU DO NOT KNOW MY LOVE AND BETRAY ME, SO THAT YOU CALL WHAT IS THE TRUTH A LIE AND CALL FAITH IGNORANCE. The upheaval of the Universe on listening to the laments of men is coming: the Sun is heating the Earth like never before (1), and in an instant darkness will reach the Earth unannounced, allowing the leading role in the firmament to be taken by the glare that prevents man from seeing clearly, until the din echoes on Earth and everyone is aware that what was announced by Me and by My Mother is true. Pray, upheaval is coming to humanity. Pray, the peoples rise up, crying out for mercy, and My children suffer. Pray for the lands of North America; they are shaken and lashed by nature. Pray with your heart for the Institution of My Church, for your brothers and sisters who suffer persecution, for the oppressed and the hungry. I WILL SEND MY CELESTIAL ARMIES TO MOVE HEARTS; I DO NOT WANT YOU TO BE LOST, CHILDREN, I DO NOT WANT YOU TO BE LOST. CONVERSION AT THIS INSTANT IS THUS MORE THAN A DECISION, IT IS THE CONVICTION AND GOAL OF ALL MY CHILDREN. INTERNAL WORK IS URGENT, more so than at other instant, due to the temptations surrounding you and the surprising suffering from climatic, atmospheric and cosmic phenomena that you will encounter. Continue in prayer, in faithfulness to Me and in loving your neighbor; give your hand to your brothers and sisters. Preach without words and with words, give prayer, comfort, love, be missionaries of My Love living in constancy and self-donation. BELIEVE, I AM WITH YOU (cf. Mat 28:20) AND YOU NEED TO TRUST ME. (2) The great Warning of God to humanity is near! I call you to meditate on My Words, although the lack of awareness among some of My children obscures My Calls. I THEREFORE COME BEFORE HUMANITY WITH MY LOVE, MY MERCY AND MY JUSTICE. My Mercy sees a child of Mine who is repentant and has a firm purpose of amendment, as if looking at them for the first time, offering them the best of My House. My Mercy overflows in front of a child who is truly repentant and prepared not to offend me anymore. I am clement and just at the same time. Do not fear, do not retreat, continue being testimonies of My Love; only then will you be able to continue going forward. Those who are not testimonies of My Love will be confused and led down other paths that only lead to perdition. MY PEOPLE, YOU MUST BE MY VERY OWN LOVE. I INVITE YOU TO BE NEW CREATURES, TO PUT ASIDE THE SIN THAT LEADS YOU TO SPIRITUAL DEATH; DISPOSE OF YOUR OLD GARMENTS, FIGHT AGAINST THAT DRUNKEN “EGO” WITH WHICH YOU HURT YOUR BROTHERS AND SISTERS, WITH WHICH YOU HURT THOSE CLOSEST TO YOU, AND ME. Pray My children, pray for Italy, it suffers, the earth shakes. WE INVITE YOU TO VISIT THE SECTION OF “SPECIALS” WERE YOU CAN FIND THE MESSAGES GROUPED BY THEMES. AS PRINCE OF THE HEAVENLY HOST, I AM SENT IN ORDER THAT YOU MAY WOULD REFLECT. You need to return promptly to being children of Our King. You need to return with faith, hope and charity, firstly for yourselves and then for your neighbors. Our King’s side remains open on seeing His children who are in permanent confusion, not knowing where to go. Humanity finds itself dispersed by thousands of situations, conflicts, dangers, changes, projects, and because of this you have decided to immerse yourselves in what you consider your rights and happiness, health and well-being, triumphs and blessings. Children of Our King, to what do you have a right? AND I AM NOT REFERRING SPECIFICALLY TO THOSE WHO DO NOT LOVE HIM, BUT ALSO TO THOSE WHO, “LOVING” HIM, CONSTANTLY WOUND HIM. Man has fallen in his evolutionary level through refusing to recognize himself as a child of God … What does humanity fear? Why has it driven Our Lord and King away from its life? Is it that you fear the obligation to continue in what you reject at this instant? Is it that you fear commitments, even though they come with Divine Mercy? O humanity, how many will be lost! How many of those who claim to have faith will lose it at times because of not knowing the Giver of life! Children of Our King, you have decayed, you are decaying in Truth and therefore decaying spiritually, having less ability at this instant to resolve what life presents to you. Man has lost the spirituality for remaining firm in faith because the mind of man has been damaged, has been altered, contaminated to the very root, and man, unprotected by his spiritual capacities, falls into a constant to and from like the waves of the sea; he acts according to inertia, automatically; he has become accustomed to being less sensitive, less rational, and to taking what turns out to be most convenient for him, even when that goes against human nature itself. You want to find answers to what is unknown to you and yet you will not find them because they are not all love, but wrong copies of what the majority have established as being love. You have become weak for living in unity with Our King; you repudiate Him and do not love Our Queen, hence this detachment, hence so many ruptures, so much debauchery and the constant scourging facing humanity and so much scourging that you will face. YOU ARE HEARING THE VOICE OF ONE WHO FOUGHT AND FIGHTS FOR THE KINGDOM OF GOD, and yet at this instant I see Satan joyfully taking human creatures down the path of perdition. Those of you who adore Satan, !repent!, as this sin causes spiritual leprosy and the leprosy of the body that will scourge humanity. YOU DO NOT BELIEVE, YOU ARE SPIRITUALLY BLIND… The struggle between good and evil has not ended, it continues advancing in order to bring down the Church of Our King (Rom. 12:21). Being spiritually blind, how do you intend to guide your brothers? You will be blind leading the blind, and both of them can fall into the abyss (cf. Mt 15:14). YOU ARE SICK AND I HAVE TO CALL YOU TO BE HEALED SO THAT YOU DO NOT LOSE ETERNAL LIFE. HOLD TO THE TRUTH, DO NOT GO ASTRAY, RECOGNIZE WHEN YOU HAVE FALLEN AND BE FULFILLERS OF THE LAW OF GOD SO THAT YOU ENJOY ETERNAL LIFE. Do not align yourself with ideologies; Our King, Christ, is not an ideology, He is the “Way, the Truth and the Life” (cf. Jn 14:6). Embark on the way of conversion: it is urgent. Humankind is suffering and will suffer through bearing its own torments. Divine Mercy calls you make amends in order to welcome you. Do not forget that you have the freedom to choose between the right path and the easy path of perdition. Pray as the People of God for peace where pain provoked by man reigns at the instant. Pray as the People of God for one another so that all decide to make amends. These are not the instants for the lukewarm to contaminate the wheat with the pests of crises of faith, improper and forbidden innovations. Do not let your faith be made to falter; turn away from what is worldly, as the instant is coming when the living will envy the dead (cf. Rev. 9:6). What your eyes see is painful; what they will see will be heartbreaking and what is coming for humanity carries the smell of death. YOU DO NOT NEED TO BE LEARNED, BUT TO BE FAITHFUL TO THE MOST HOLY TRINITY, LOVERS OF OUR QUEEN, TO BE HUMAN BEINGS WHO ARE CONVERTED AND CONVINCED, ENTERING INTO THE KNOWLEDGE OF THE TRUTH AND READY TO BE FULFILLERS OF THE DIVINE WILL. Do not be troubled if you love in “Spirit and Truth”; be defenders of the faith, be faithful to the Most Holy Trinity and to your Blessed Mother. WE ARE YOUR TRAVELLING COMPANIONS, YOUR PROTECTORS; WE COME TO PROTECT YOU WHEN YOU ALLOW US TO DO SO: BE AWARE OF THIS. Believe and bless one another. 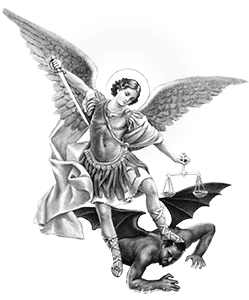 St. Michael the Archangel, servant of God One and Three, and servant of the Queen of Heaven and Earth. Humanity, enter into relationship with God before night arrives; go to God’s protection. Do not turn away from the Queen and Mother. Evil remains attentive in order to ensure you are lost. Children of God, do not be distracted or foolish: you are blessed with the knowledge of the Revelations that our King and Lord Jesus Christ and our Queen and Mother, the Blessed Virgin Mary, have given to humanity. It is the Love of Heaven so that the People of God are not lost. Man’s patience is put to the test. The Queen and Mother of Humanity has upheld the Divine Arm so that you have the opportunity to convert, and so more souls might be saved. EVIL, KNOWING THIS, SPEAKS TO MAN, TELLING HIM THAT TIME HAS PASSED, AND NOTHING HAS BEEN FULFILLED—LIES AND DECEIT SO THAT YOU WOULD BE LOST. YOU CAN SEE WHAT HAS BEEN PREDICTED BY HEAVEN BEING FULFILLED BEFORE YOUR EYES, AND IT WOULD BE BETTER FOR YOU NOT TO WANT WHAT IS STILL TO COME IF YOU ARE NOT PREPARED. I therefore come to warn you. You know about nature and its changes being more drastic, such as you have not experienced them. The earth will be in constant danger, relations between the West and the East will worsen, provocation will be mutual until the coming of lamentable events for all humanity. The Church of Christ is not advancing: it is regressing and shaking. The great earthquake shakes much of America and awakens other fault lines; the earth’s movements increase; where it did not shake, it now shakes. This will be in order to awaken men who remain immutable! As messengers of God, we go to meet man if you allow us to do so; we remain attentive. 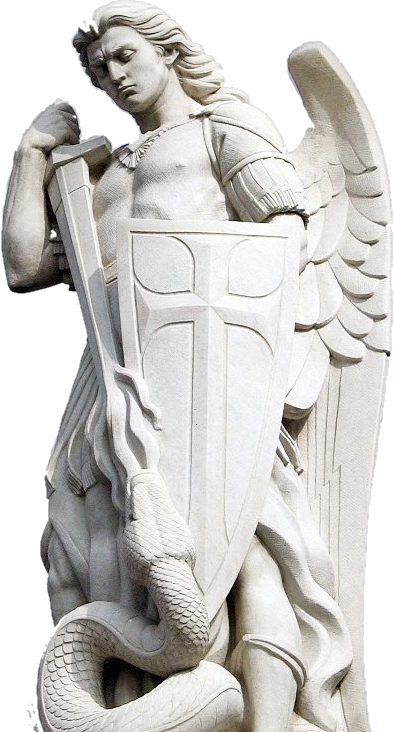 Your guardian angels beg you for conversion before evil completely confuses you and gives you stones instead of bread. You are living according to plans that you draw up in human fashion, plans separated from God, with human feelings and an apparent awareness that what you believe is right, within the concepts of the masses whom you follow. Not everything that man does is wrong, but … WORK AND ACTION IS MECHANICAL FOR THE MOST PART; YOU ALMOST CANNOT DISTINGUISH ONE FOOT FROM THE OTHER BECAUSE YOU DO NOT PAUSE IN ORDER TO DISCERN, AND THUS YOU FALL INTO MISERY. The Divine Plan is perfect – and man? Are those who call themselves children of God collaborating with that Divine Plan or have they destroyed it? In order to cooperate with the Divine Plan, you must attract blessing and be a blessing, but your interests are different from those of God. Evil has penetrated within man and has made him an object of its plan; personal interests stand out without bringing happiness. Confusion succeeds in dividing, and division is the cause of the disintegration with which the antichrist has set out to create schism in My Church. THE BATTLE BETWEEN GOOD AND EVIL HAS NOT CEASED, IT REMAINS IN EFFERVESCENCE. Evil is increasing its strategies against My children who, weakened by worldliness and adhering to the tentacles of evil, have been corrupted by licentious ideologies and their falsehoods. My People have created gods at will, adoring them, debased by the depravations of the evil one against Me. My children, I carried the cross of each one of you, I carried it with your sins, and yet humanity minimizes it with such depressing concepts that even My Angels cry over it. YOU VIEW MY PASSION AS A SPECTACLE, PUTTING ASIDE THE LOVE OF MY FATHER FOR HIS CHILDREN. How some of those who think they represent Me insult Me! They exalt ideologies; man revels in the power to kill those who are helpless and innocent. Thus the devil, magnified by sins against the Gift of life, now claims his plunder, that of the souls of those who pronounce the death sentence against the innocent. I AM MERCY; THE MAN WHO CARRIES OUT PLANS AGAINST THE GIFT OF LIFE IS FREE, AND IN HIS FREEDOM HE IS RESPONSIBLE FOR HIS JUDGMENTS. My people, the closer you are to the fulfillment of the Revelations that My Mother and I have given for the world so that all men convert and save their souls, the more strategies the antichrist uses against My children and the children of My Mother so that they would be lost. Sacred Scripture is forgotten, annulled by some and distorted at will by others, with the aim of belittling Me as King and Lord of Heaven and Earth (cf. I Tim 6:15; 1:17). You should believe in Our Trinity and as faithful children open your consciences in order to understand that sin leads you to misery, to fatigue, and that the Devil will not offer you a state of permanent joy, but gives you over to states of euphoria so that you stain your souls and contaminate your brothers and sisters. Beloved My People, at this instant it seems that man likes to view himself as one body, without being one. Not all love me, not all obey me, not all adore me, not all honor me, not all love My Mother or respect or revere Her. I see you absorbed in evil thoughts that do not bring you any fruit, but you enjoy those desires to which the devil incites you because you have separated yourselves from Me. I DO NOT WANT A FAITH WITHOUT FOUNDATION, WITHOUT INNER LIFE, WITHOUT WORKS, ” FOR AS THE BODY WITHOUT THE SPIRIT IS DEAD, SO FAITH WITHOUT WORKS IS DEAD” (James 2:26). MY LOVE AND MY WORD ARE THE WAY, THE TRUTH AND THE LIFE (cf. Jn. 14:6). My beloved People, do not be anxious about the things of the world (Mt. 6:25); you are different, you love My Truth, therefore you experience and will suffer pain for not departing from My Truth. I HAVE POURED OUT BLOOD AND WATER FOR THOSE CHILDREN OF MINE WHO IN CONFUSION CHOOSE THE WRONG WAY, ADHERING TO LICENTIOUSNESS AND TO ERROR. My people, remain united by praying in season and out of season, without forgetting that you need to put your faith into practice towards your brothers and sisters. Be My own Love. My beloved People: humanity embraces so much progress, especially in technology, and I am showing you that humanity will be deprived of this technology. The Earth has been martyred by man and by the great world powers that have inserted misused technology into it, with which they have poisoned it. The Earth has changed in its core, being vulnerable and making man vulnerable to the effects of the sun. Beloved children, social uprisings do not cease; they are increasing and the scourging of My children is continuous. COME TO ME, DO NOT CONTINUE TO REFUSE ME; DO NOT OFFEND MY MOTHER, SHE IS THE DAUGHTER OF MY FATHER, MY MOTHER AND THE TEMPLE AND TABERNACLE OF OUR HOLY SPIRIT. I call you to pray for the United States, it is fiercely shaken. I call you to pray for yourselves so that you are not confused in the faith. I call you to pray: the earth shakes from one end to the other. Do not turn away from Me; My Mother continually stretches out Her Hand in front of each person. My Angel of Peace (2) watches you and is waiting in My Will in order to help My children. My Angel of Peace suffers at the refusal of My own to love and respect Me, He suffers at the refusal of My Mother’s Love. I do not forsake you, I stand by you: accept Me. Do not forget that the devil has come to divide My own so that they are easy prey for Him, since united he will be unable to bring them down. Be My own Love, forgive so that I forgive you, be humble and charitable so that with your testimony you are a reflection of My Love. My Blessing is with you. Oh men of this generation! How you are continually rebelling! How many sins of My children will come to light, bringing great pain to My Son’s Church! I bless all those who are sick so that in sickness they may be able to find love when it is offered up for the salvation of souls. I bless those in tribulation, those who despair, so that they may offer everything to God for the salvation of souls and view life’s situations with different eyes. IN EVERY BEAT OF MY HEART THE PAINS THAT I SUFFER ARE FOUND DUE TO THE INGRATITUDE THAT HUMANITY CAUSES ME, JUST AS IN MY HEART IS FOUND THE CONSOLATION OF THOSE WHO LOVE ME AND MAKE REPARATION FOR THOSE WHO OFFEND ME. I have warned My children throughout the Earth to be aware of their deeds and acts and the consequences of vices and seductions for the human soul. I have warned you about the presence of the Devil, lying in wait for you so that you go against human nature and commit acts of the most unthinkable baseness. YOU FORGET THAT ALL ACTS AND WORKS WILL BE JUDGED, SINCE YOU HAVE AWARENESS OF THE “SCIENCE OF GOOD AND EVIL” (cf. Gen 2.17) AND HAVE FREE WILL, AND THEREFORE HAVE SET BEFORE YOU THE INEFFABLE JOY OF MY HOUSE OR THE ETERNAL PAINS OF HELL. I have called you to be apostles of My Love; the apostle knows that with only good intentions they will not be able to change themselves or change their fellow men, but they must be a fulfiller of My Law and then help their brothers and sisters with My own love and My own charity, forgiveness, faith, hope, with prayer and a consistent commitment to the fulfillment of the purposes with which they have decided to surpass themselves in the spirit. I hear so many good intentions, but the majority stop at that, at good intentions, since they are so inconsistent; therefore few possess the necessary inner strength to succeed in being the yeast of My Love. My people, teaching of doctrines contrary to the faith, contrary to My Teachings, is spreading. May you be beacons by which the instants in which you are living can be seen, and do not deny what you cannot deny, so that you remain attentive to improving and not allow yourselves to be intimidated by those who, pretending to be great scholars, impose norms on you that are contrary to My Law. I CALL YOU TO REMAIN IN PRAYER AND TO PUT IT INTO PRACTICE WITH YOUR BROTHERS AND SISTERS IN ORDER THAT SATAN DOES NOT HAVE POWER OVER MY CHILDREN, BECAUSE I AM ARRIVING WITH MY JUDGMENT AND NO ONE WILL ESCAPE MY HAND, BECAUSE I WILL FIND ALL THOSE WHO HAVE DISOBEYED ME, WHO HAVE CORRUPTED MY INNOCENTS. THEREFORE YOU MUST CHANGE, YOU NEED TO REPENT AND COMMIT TO CONVERSION AT ALL INSTANTS. Everyone has had an opportunity, I have offered it to all so that you do not get lost and manage to repent, but you have scorned it, you have accepted evil as the staff on which you lean in order to walk. DO NOT EXPECT MUCH TIME, BECAUSE THE OFFENSES AGAINST OUR TRINITY ARE THE WORST, the most repulsive and heartbreaking to which man can consent in order to wound Us. The Devil has usurped hearts and led them to edict norms that go against Me, those about which I have warned you and which you see before your eyes. My faithful do see them; those who do not love Me do not see evil in anything, but I will arrive when they least expect it. My beloved People, you are heading towards the abyss and yet you feel that you are living in security; you have abused My Mercy and I will not allow it any more. Remember what happened in Sodom and Gomorrah: thus with lightning, unbearable thunder, lightning never seen, unstoppable and strong winds carrying fire with them (cf. Gen 19: 23-29), so this generation will suffer more than Sodom and Gomorrah, because the crimes of this generation have surpassed all previous ones. You see me as one who has no power on Earth, and you have emptied the human heart of My Love. You will feel insatiable thirst and it will be the thirst of My Word in your midst. Repent, repent of the horrors that a great part of this generation are committing, abominations that will increase by the will of those who hold decision-making power on Earth; city after city will fall into terrible sins and for all it will be a great triumph to raise one’s hand against the innocent. The Devil whispers in man’s ear and urges him to act by raising his hand to kill; this is the culture of death, the devil’s madness that will not be long in coming for humanity. Pray children, pray for Germany. Pray children, pray for Chile, it suffers severely. Pray children, pray about the ravages of nature in the United States. Pray children, pray for Cuba so that its inhabitants convert. Pray for Ecuador, it shakes. My beloved people, blood flows over various lands; disobeying My Commands, man walks without meaning through life, causing damage to himself. I call you to renew love for Our Trinity and for My Mother; it is urgent that spirituality be the hallmark of My faithful People. As I am all Mercy, I do not deny My Forgiveness, but you need to come before Me with your heart, mind, thought and all senses directed towards a goal: NOT SINNING OR TAKING PART WITH THOSE WHO OFFEND ME; YOU NEED TO BE TRUE AND TO ACCOMPLISH WORKS OF MERCY (cf. Mt 25,31-46), DECIDE TO GROW IN LOVE TOWARDS NEIGHBOR AND BE CHARITABLE, WITHOUT DECREASING IN HOPE, SO THAT FAITH REMAINS FIRM. My people, you are the apple of My Eye and you forget it: you become engrossed in what is worldly and easily fall into the mire of the darkest and most terrible sins. Because of this I call you to be faithful to Me, to listen to My Mother, to fulfill My Law properly. The goodness of My Love does not delay in the midst of great calamities; I will amaze you with the wonders of My Love for My faithful People. MY MERCY IS POURED OUT IN ABUNDANCE ON THOSE WHO SURRENDER TO ME WITHOUT HOLDING BACK, ON THOSE WHO REPENT AND CONVERT, ON THOSE WHO DO WORKS IN FAVOR OF THEIR BROTHERS AND SISTERS SO THAT THEY SAVE THEIR SOULS. I am your God and I assure Eternal Life for Those Who Keep The Faith. Come to Me!, I bless you with My Love. HUMANITY WILL EXPERIENCE PURIFICATION, IN WHICH IT WILL BE SERIOUSLY TESTED BY EVIL; it will tempt it as never before, it will lead it to cruel instants, trying to make you deny being a child of God. Evil’s striving will reach its culmination with the goal of leading My children to evade the pain of that cruel instant, offering themselves to be marked (*) in order to obtain the benefits of those who will have whatever is necessary in order to live without needing anything. BEING ACTIVE WITHIN MY SON’S LOVE MEANS GROWING SPIRITUALLY AND SURRENDERING UNRESERVEDLY TO THE DIVINE WILL. From pain and persecution, the Church of My Son will go to finding the door of Glory, totally surrendered to Divine Love, not to what you call “love for God” in this instant. SOME SAY THAT THEY LOVE GOD, AND YET DIVINE LOVE IS VERY DIFFERENT: IT IS THE FUSION OF MAN WITH HIS CREATOR. THE DIVINE WILL WILL TRIUMPH AND ALL CREATURES WILL LIVE IN IT AND PEACE WILL REIGN IN ALL PEOPLE. THE KINGDOM OF GOD WILL TRIUMPH “ON EARTH AS IN HEAVEN” (Mt 6, 10b) AND MY CHILDREN WILL LIVE JOYFULLY IN TRUE LOVE. But now, My children, you must pray and act, for you have not been purified of everything. Blanched sepulchers are plotting against My children; the learned feel that they have God’s truth and because of this they take justice into their own hands. Do not fear, children, as this Mother keeps you on constant alert and defense so that evil does not take you unawares. EVERY HUMAN BEING SHOULD REJOICE AT BEING A CHILD OF GOD AND HONOR HIM AS GOD DESERVES, SERVE HIM AND WORSHIP HIM, KNOWING THAT GOD DOES NOT NEED MAN, BUT LOVES MAN. WE ARE THE SERVANTS OF GOD AND WITH INFINITE ADORATION OUR JOY ATTAINS ITS CULMINATION IN LIVING THE WILL OF GOD, AND THIS WILL DIRECTS US TO SERVE MAN, but within this service we are not allowed to act against man’s free will, because man is free and within freedom he must choose salvation by his own merit. That salvation which a great part of Humanity rejects because of having become dehumanized, scorning its essence as children of God and taking as its own a collective mentality, thoughts and desires that are alien to it. The man of this generation has immersed himself in modernistic thought where there is no room for God. You cannot value the works or acts of others because it is personal truth dwells in each person, not that of others.. HENCE THE FAILURE OF THOSE WHO WISH TO GROW IN THE SPIRIT BY LOOKING AT THEIR BROTHERS AND SISTERS, HIDING THEMSELVES BEHIND THEIR BROTHER IN ORDER TO HIDE THEIR ERRORS. Therefore man does not rise up, he does not aspire beyond what is earthly, he does not long for greater closeness to the Divine; it is only, yes only by facing the enemies of inner truth that man will be able to see his own reality. WHEN MAN ACCEPTS THAT ALL STRENGTH COMES FROM GOD (Cf. Ps 37,39, Hab 3,19), THEN PERSONAL CHANGE WILL BEGIN. People of God: look, meditate and be aware of what is around you – the Universe with the elements is maintained for the service of man, and WHAT HAVE YOU DONE WITH IT? YOU HAVE DESTROYED, CONTAMINATED, TRANSFORMED IT FOR EVIL, YOU HAVE DISOBEYED SEEKING THAT WHICH YOU CONSIDER TO BE HAPPINESS. Men have created frontiers for thought by limiting themselves, taking possession of knowledge that is not their property. Children of God: you, at this instant, must share the love that comes from the Divine Will in order to create the force to counteract the demonic wave experienced among Humanity, anticipating the pain to which the Church will be subjected. You know full well that love prevents evil: it is a wall that holds it back; love is reflected in the actions of creatures that do not cause harm to any brother or sister and seek the common good (cf. I Cor 13,4-8ff) . You must be disciples and missionaries at the same time, like Our Queen, who from the Annunciation to her Assumption into the Heavens, through Her Faithfulness and Her Motherhood, reached Eternity. THE PEOPLE OF GOD WALK TOWARDS THE FEAST OF OUR QUEEN AND MOTHER OF HUMANITY AND BEFORE THIS SOLEMNITY ITS GLORIES ARE SUNG IN HEAVEN. FOR THIS MEN OF GOOD WILL SHALL UNITE ON THE 29TH, 30TH, AND 31ST OF DECEMBER AT 6PM IN EVERY COUNTRY, WITH THE PRAYING OF THE “ANGELUS” (*), OFFERED FOR THE NEEDS OF HUMANITY. When the Cross is despised, you must love it more … satan suffers enormous torments when he sees the Cross: for that reason he has ordered it to be taken out of every place. What the devil forgets is that Christians carry the Cross in their hearts, in their souls, where evil and its followers cannot erase it. Children of the Most Holy Trinity, the future of Humanity must be fought with love. Our Celestial Armies remain attentive to the work and action of Humanity, and therefore to the events in the natural order which Humanity will face. Pray children of God, in the Mediterranean there will be subsidence in the seabed. Pray children of God, the South Pacific shakes. Pray children of God, the volcano Etna is changing its activity. Pray children of God, in Turkey many innocents suffer persecution for being faithful to Our King. Pray children of God, pray for Nevada in the United States, it will be flooded by water. It is not human predictions that the children of God are reading, but I have been sent to warn you out of Mercy, since the one who loves God knows that from His Love emanates knowledge so that man takes it, and so that, with the knowledge of the events that are approaching, man understands that whoever loves does not fear. Children of the Most High, I shelter you, you are protected by your Guardian Angels, whom you must not forget. HOW MANY HERODS THERE ARE! … LOOK AT YOURSELVES, EXAMINE YOURSELVES, IT IS NOT ONLY THE ONE WHO USES A WEAPON WHO KILLS. Humanity is seething with a total lack of love, and the children of God must not sleep, but respond within the love to which the Most Holy Trinity has called them. Evil has become entrenched within Humanity and claims souls for itself; you must remain faithful to God and not allow yourselves to be confused. The Angel of Peace, Envoy of God (1), will arrive to protect man; the children of God will never be abandoned by God. I bless your acts and your works. “GLORY TO GOD IN HEAVEN AND ON EARTH PEACE TO MEN OF GOOD WILL”. (Lc 2,14). I see the Divine Word being fulfilled and before all creation, the defenseless Man-God is protected by all the Angels of God. PREPARE THE WAY, THE SAVIOR HAS COME! The Savior, until the end of time, will permanently keep calling His children so that they accept being saved and so that His Sacrifice is not in vain. Humanity has been purified because of its lack of obedience and humility … How difficult it is for man to see his own mistakes and recognize the Love of loves in his brothers and sisters! MAN MUST FEAR THAT THE WINDS OF THE LACK OF LOVE FOR NEIGHBOR, OF THE LACK OF HUMILITY, OF THE LACK OF CHARITY, OF THE LACK OF FAITH, EXTINGUISH THE LIGHT OF HIS PERSONAL LAMP. O Man!, eyes clouded by the darkness of pride and stubbornness are an obstacle preventing the drops of Divine Love from clarifying the vision of those who never find satisfaction for their reasoning, for their intellect, and these stone hearts will be forcefully polished. The Great Maker does not want any of His children to be lost, therefore what is given to the simple and humble of heart is not given to the learned, because some will never come to recognize the Light of God in a humble creature, but the humble will indeed recognize the one who, like them, bears the Good News. People – look, do not close your ears, for night is falling! THE ENEMIES OF THIS DIVINE CHILD WILL BE UTTERLY CONFUSED, SINCE THOSE AND ONLY THOSE WHO LOVE IN SPIRIT AND TRUTH WILL FIND THE LIGHT OF THIS KING, WHO WITHOUT AN EARTHLY PALACE IS THE MASTER OF ALL CREATION. That approaches which will maintain the heart of man as if in darkness without being darkness, and in confusion out of fear of recognizing how finite man is. Man prefers to remain isolated out of fear of confessing his need for God in his life, he refuses to be instructed out of fear of accepting what is of God. THE KING OF KINGS HAS COME: AS A CHILD HE IS NOURISHED BY HIS MOTHER AND OUR LOVE WARMS HIM. OH ADORABLE MAN-GOD, YOU CAN DO ALL THINGS, YOU ARE EVERYTHING, YOU KNOW AND KNOW ABOUT EVERYTHING! YOU GIVE ORDERS TO THE CREATION AND IT RESPONDS “IPSO FACTO”; ONLY MAN, WHOM YOU LOVE THE MOST, REJECTS YOUR LOVE AND DOES NOT ACCEPT BEING CORRECTED, BUT ON THE CONTRARY, THE TIME WILL COME WHEN HE WILL FORGET YOU AND WILL ERECT ALTARS IN HIS HEART TO LOVE HIS OWN SELF. How limited is the man who expands without any breadth where he ought not to and, without limits, crosses over where he ought not to, coming spiritually to a halt while being capable of transcending more of what his eyes can see! How much I would like to see man rising up in his spirit and scaling the heights of true Wisdom proceeding from the Holy Spirit, without halting the growth for which he should long, believing in Almighty God, Creator of Heaven and Earth, of what is visible and invisible! O Man, see the one who has come to save you! Do not close the door to Him, carry faith forward and ascend, but say: “I believe in God Almighty, Creator of Heaven and Earth …” Say it, confess it with your words that the Word was not made, the Word already existed from the beginning. Do not forget that in the beginning God made Heaven and Earth through the Word that was with God, that was God … (cf. I John 1,1). God made man did not come to man as a sinner – no! – but He did come to save the sinner who wishes to make amends and to be saved. O HUMANITY! ACCEPT SALVATION; MAY EVERYONE BE A LAMP OF PRAYER AND A PROCLAIMER OF THE DIVINE WORD; MAY ALL BE BROTHERS AND SISTERS IN SPIRIT AND TRUTH. Every prayer is light, every prayer is charity, every prayer is brotherhood. Every amen is light, every amen is a yes, every amen is love. Every Mass celebrated worthily and every Communion worthily received, spreads throughout creation. Salvation is for all Humanity and every act in favor of that knowledge is light that spreads, repairs, and is an act before the Celestial Throne in favor of people of good will who intercede for their brothers and sisters. WE GUARD YOU, WE STAND BEFORE HUMANITY, SEEING THOSE WHO DO NOT HOLD BACK SPIRITUALLY IN FAVOR OF THEIR BROTHERS AND SISTERS, AND SEEING WITH DEEP SADNESS THOSE WHO SCORN SALVATION. THIS DIVINE CHILD IS REBORN IN HUMBLE HEARTS, IN THOSE WHO SEEK HIM, IN THOSE WHO WANT TO KNOW HIM, AT DAWN OR AT NIGHTFALL. THIS DIVINE CHILD BORN OF THE VIRGIN MARY CALLS YOU TO CONVERSION. Pray, people of goodwill, the earth shakes and the People of God pray and cry out, make reparation and act, love with Divine Love in the unity of the Sacred Hearts. Beloved children of My Immaculate Heart, may this Christmas not be one more in the midst of your commitments, forgetting My Son.